Husband and wife team Amy Lillard and Matt Kling are a rare breed: They're Americans making wine in France. But they've brought a little American ingenuity to the traditional French winemaking process. 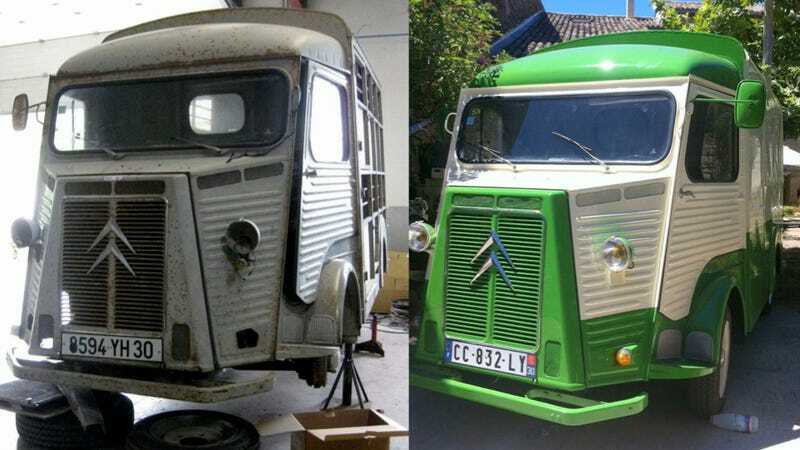 Their tasting room is a 1979 Citroën HY Van. Lillard and Kling's operation is a small one. They've owned a small vineyard near Uzès, France since 2005 and they make and bottle wine in a little shed behind their house. With most of the extra space in their home filled with winemaking equipment and bottles, they don't have much space to host tastings. We were trying to brainstorm ideas of how to sell more wine locally without having a full-blown tasting room. One day Matt said, "Why don't we buy a truck, make it like a food truck, but do wine tastings," and that's how the idea was born. Lillard and Kling's van needed some work when bought it, and they raised money for the restoration project through kickstarter. In its former life, their HY had been used to haul horses back and forth between French ranches. An old ad for the HY says it can carry two cows, or six to eight calves, or eight to ten pigs, or 25 to 30 sheep. After restoring the truck, Lillard and Kling set it up to carry two people and a mobile kitchen. They'll serve wine and light snacks through a new lunch counter-style opening along the driver's side. It would be great if they could import the idea back to the states, but I doubt the authorities in most American locales (save New Orleans, perhaps) would be keen on allowing food trucks that sell booze.